Another great week with awesome projects! It is seriously a treat to look through all of the projects. And, I'm so excited that there are a few more links each week. Here are my picks for this week. I have a feeling I'm going to always be saying how hard it is to choose. Well, it is. Never realized until I was the one trying to narrow it down. Cassidy over at Thrillingly Thrifty made this completely adorable mobile out of t-shirt scraps. Her little one is due soon, and I'm guessing she's starting to go into nesting mode. I love the baby view, pictured below. Such a sweet idea, and I'm a sucker for mobiles. Heather at Not Just Straight Stitches painted this vase using the mod podge technique I've been seeing around blogland recently. However, she had the brilliant idea of making it variegated for a beautiful effect. I love the warm colors, and it's just beautiful. I have quite a few dollar store vases around just screaming for something like this. So inspiring! 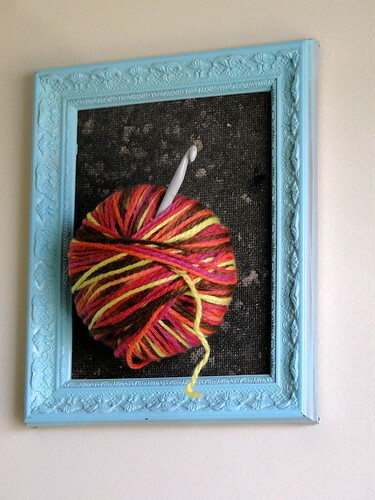 Lastly, Casey at Randomness made this fun framed yarn ball from a dollar store frame and a crochet hook from her grandma. If you've read Casey's blog at all, you know she loves this yarn! It's perfect for her. I love the sentimental crochet hook and the bright blue frame. I would love a series like this in my craft room, one for each of my crafts. How fun would that be? Oh, and if you hadn't noticed, I made "I've been featured buttons" over there -----------> somewhere, so if you've been featured, you should grab one! Link to the actual post, and not your blog main page. I'd appreciate a link back to my blog, but it's not required. Comment on one other link. Please, link us to something you made, not something you are selling or an unrelated post on another topic. Hey, don't forget, there are still a few more days to enter Simply Steff's I-Spy Bag give away! Your odds are still really, really good! Just leave me a comment. Couldn't be more simple. Seriously. Go go it! Kara, thank you for featuring my yarn art! !